The eggplant shells remind me of Cajun pirogues. These are canoes used by Cajuns to paddle quietly through the marsh and swamps of Louisiana, often in shallow water. These flat-bottom boats are perfect for setting out crawfish traps, hunting and fishing. Each dugout boat is hollowed out of a single cypress tree log. The flat bottoms are a little tipsy, but the boats are small and light and can easily be turned over to empty out water. In our modern age, flat bottom aluminum boats have largely replaced the wooden pirogues. 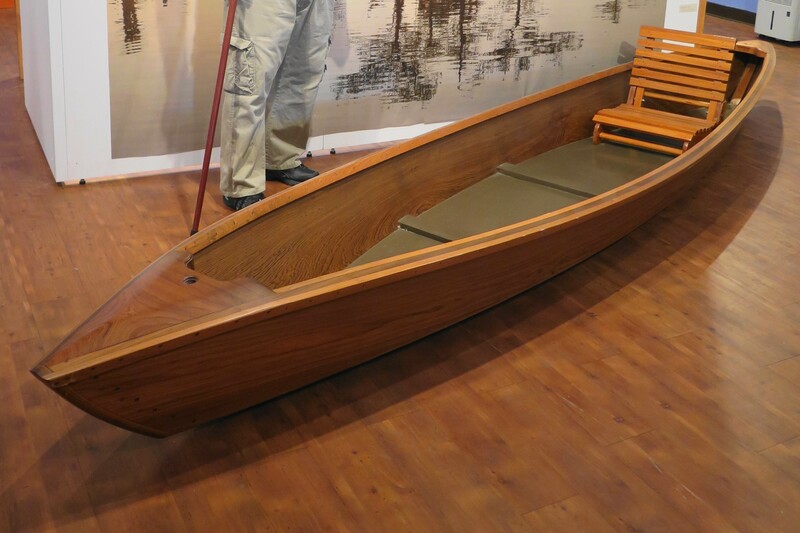 But the art of making these boats still exists; here is a beautiful pirogue fashioned by a Cajun gentleman, shown in a West Baton Rouge’s museum exhibit of “Water Trails of the Atchafalaya” several years ago. I never will forget my experience years ago of going crawfishing with friends in one of these aluminum flat-bottom boats in the Achafalaya swamp. Wading in the water, we set out traps with of chicken necks and then returned an hour or so later in the boat to pull in the traps. What an adventure. Glad we went with folks who knew what they were doing; a little intimidating — especially watching a snake swimming in the water past us. This is a recipe that I’ve adapted from one using shrimp in the filling; so if crawfish are not available — small peeled shrimp (raw, either fresh or frozen) can be substituted. The recipe benefits from slow cooking times both to cook the eggplant and blend the flavors together. There’s no need to rush on this recipe. I have seen several ways to make the dish. Some recipes call to boil the eggplant halves first which cooks the eggplant. Then it is finished in the oven for a short time. I am going to hollow out raw eggplant shells and save the eggplant pulp, cook the pulp with seasonings and then stuff and bake the eggplant “pirogues” for a longer time. Either method works. For this recipe, I chop onions, bell pepper and celery very finely using a food processor. This find blend is a flavorful seasoning for the recipe; a food processor makes this an easy task.The vegetable seasonings blend together along with the eggplant — nothing is too dominant. (Don’t forget to finely mince the garlic cloves, too.) Saute the onions, bell pepper, celery and garlic (“Cajun Trinity” of seasonings) until translucent in either butter (traditional) or vegetable oil. Add the reserved diced eggplant pulp from the hollowed out eggplant shells and cover the skillet loosely, turn the heat on the stove down. Stir and cook over slow heat for about 15 minutes until the eggplant softens. Add a little water if the mixture becomes too dry. Next add raw, peeled crawfish tails. And I recommend using crawfish which were trapped in the United States, not China or Denmark as those crawfish have an entirely different flavor. Add in Creole seasoning, parsley, black pepper and Worcestershire sauce. Cook for about 3 minutes. Then mix in Italian seasoned bread crumbs. Stuff into the reserved eggplant shells. 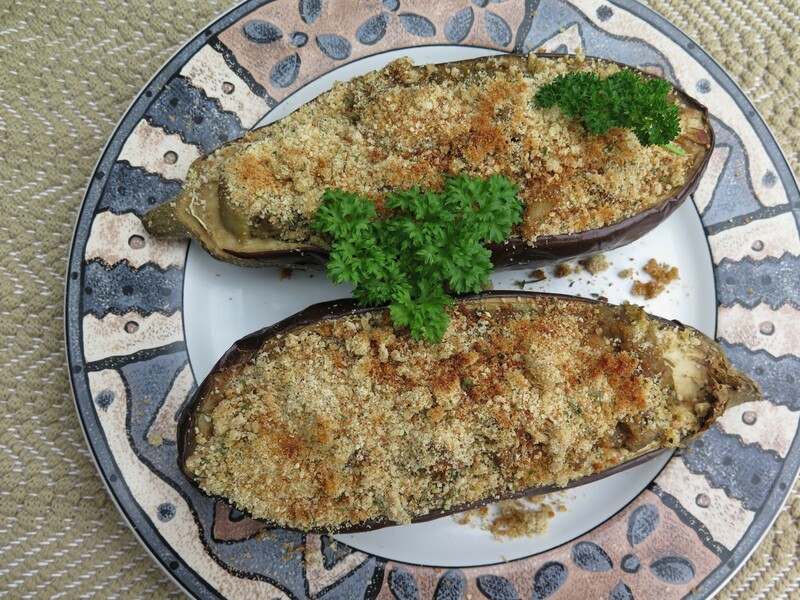 Cover tightly with aluminum foil and bake in a 350 degree oven for 30 to 45 minutes until the eggplant shells are cooked. 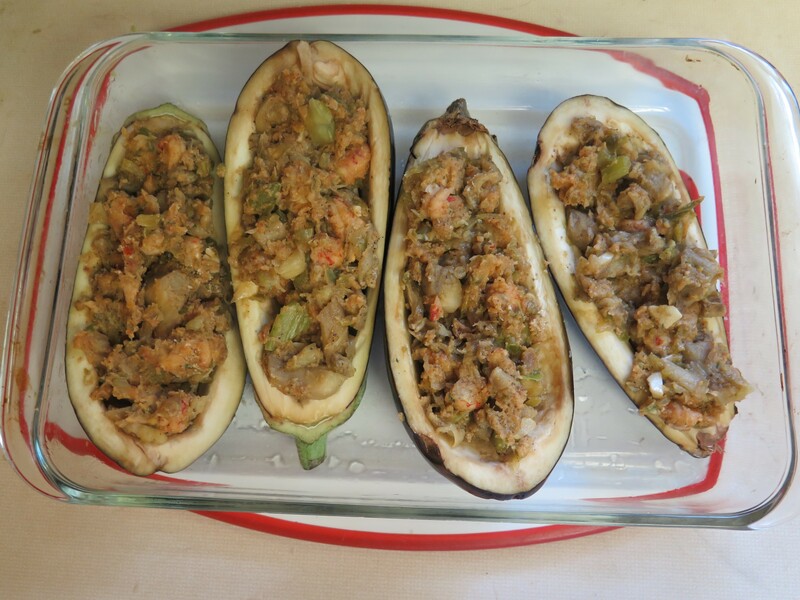 I also sprinkle a little creole seasoning directly onto the eggplant shells to flavor them, too, prior to stuffing. Remove the foil, top with bread crumbs mixed with butter or margarine and bake uncovered for 15 minutes longer until the bread crumbs brown. This recipe serves 4 persons as a main dish or 8 persons as a side dish. If I’m using this as a main dish; I increase the amount of crawfish tails to 12 oz to 16 oz. Otherwise, you need only about 8 oz peeled crawfish tails. Yum. This is a delicious way to serve eggplant and to show off crawfish or shrimp. All the flavors blend together; the dish “melts in your mouth.” Enjoy. Pre-heat oven to 350 degrees. Oil a 9″ x 13″ casserole dish and set aside. Defrost raw crawfish tails and set aside. Cut eggplants in half lengthwise. Scoop out eggplant pulp leaving a 1/4″ sides. Chop eggplant pulp and reserve. 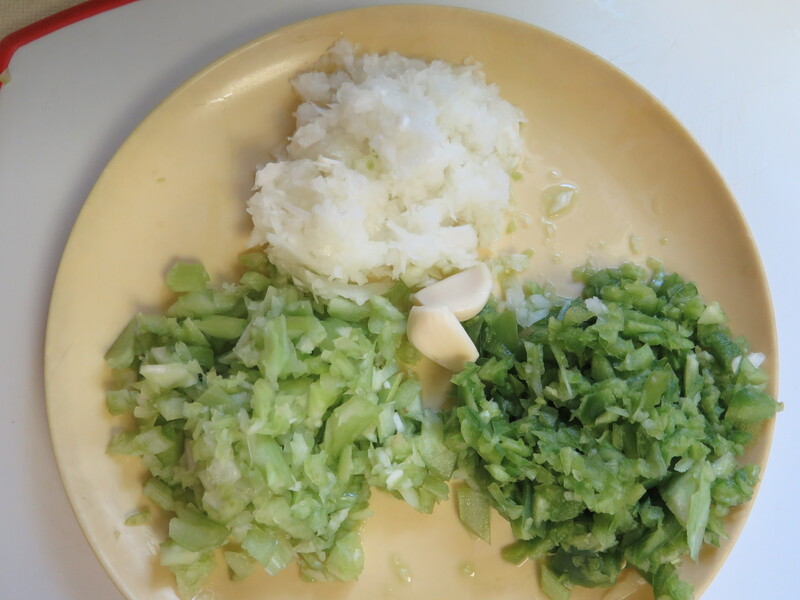 Finely chop onion, celery and.bell pepper using food processor. 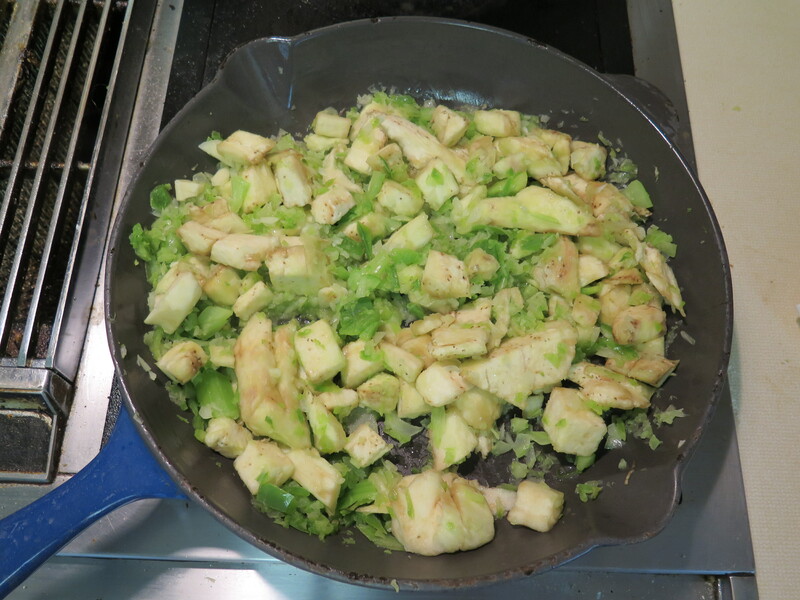 Heat 2 Tbsp butter or vegetable oil in large skillet over medium high heat. Add chopped vegetables and saute for about 10 minutes until translucent. Stir frequently and turn down heat if mixture begins to burn. Add reserved eggplant pulp and stir to combine and mix thoroughly. Turn down heat on stove, loosely cover with lid and cook on low heat for about 15 minutes until eggplant softens. Add a little water, if needed, to prevent burning. Add reserved crawfish tails and seasonings of chopped parsley, Worcestershire sauce, Tony Chachere’s Creole Seasoning and black pepper. Turn heat back up to medium. Cook and stir constantly for 3 minutes. Add 1/2 cup seasoned Italian bread crumbs and stir to combine. 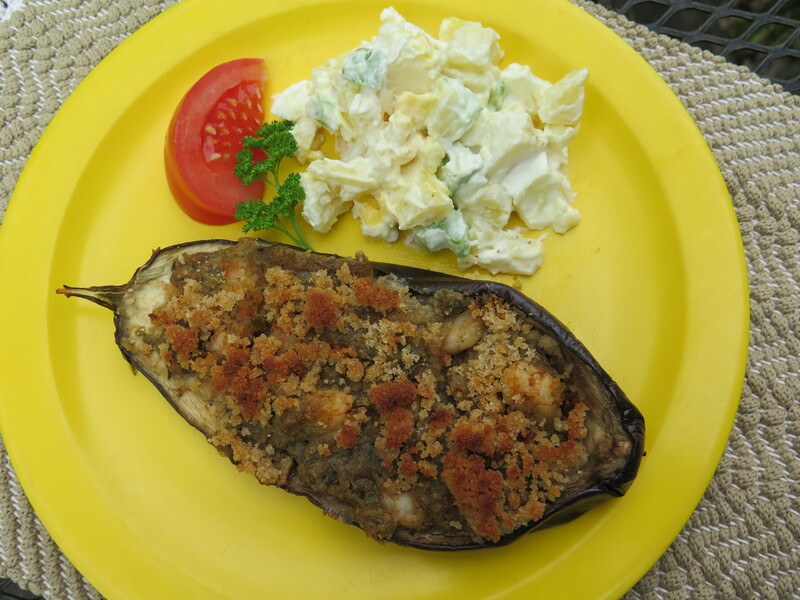 Sprinkle a few dashes of Tony Chachere’s Creole Seasoning directly in reserved eggplant shells. 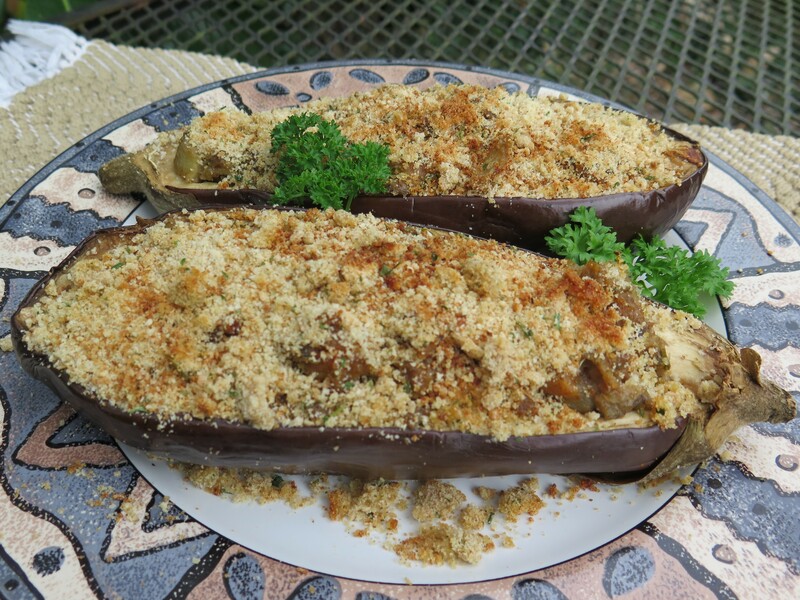 Fill reserved eggplant shells with the stuffing and place in oiled casserole dish. Cover tightly with aluminum foil. Bake in 350 degree oven for 30 to 45 minutes until the eggplant shells are cooked. In a small bowl, combine melted butter or margarine and remaining 1/2 cup seasoned Italian bread crumbs. 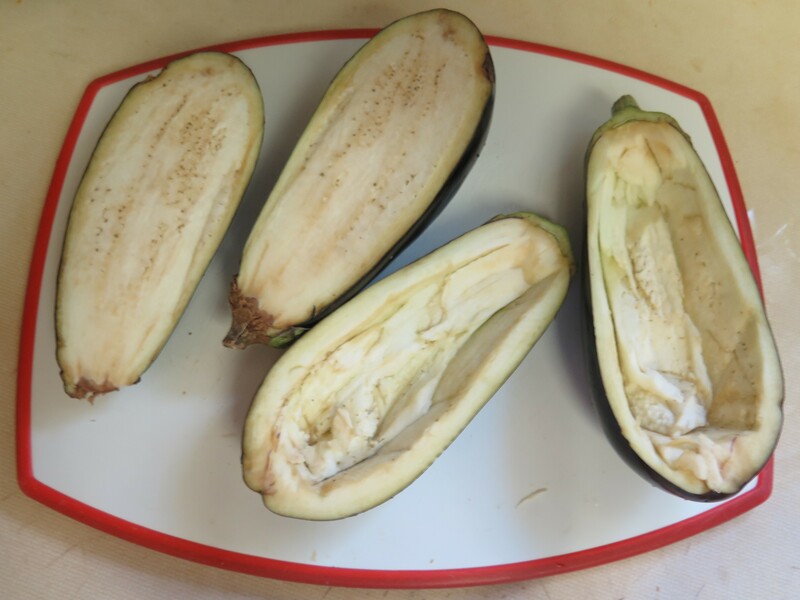 Remove foil from eggplants. Sprinkle bread crumb mixture on top of eggplant pirogues. Bake, uncovered, an additional 15 minutes or until bread crumbs brown. Remove from oven. For side dish cut each shell in half. For main dish, serve 1/2 eggplant per person. 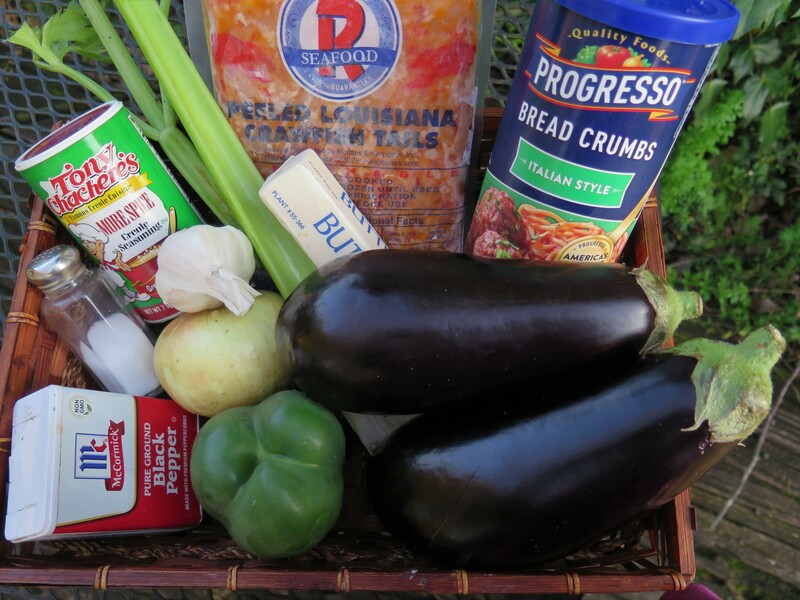 This entry was posted in Louisiana Culture, Recipes and tagged crawfish, crawfish-stuffed eggplant, eggplant, pirogue, traditional Cajun recipe by Maylee at Beyond Gumbo. Bookmark the permalink. Thanks for the feedback and compliment! Good to know that it is helpful! I enjoy preparing and posting these recipes. Please stop back again.